Removal of a permanently cemented crown or fixed partial denture is a cumbersome procedure for a prosthodontist, especially when there is no purchase point available to remove it. Many crown removal instruments (air driven, pneumatic, back action or spring activated) and techniques (ultrasonic vibrations, adhesive resin tablets or sectioning) have been described in the literature. ,,,, The techniques which use vibratory instruments or adhesive resin tablets may take longer time for removal and are not much effective. Methods which use instruments with jerky removal force may damage the gingival/periodontal tissues or underlying tooth structure. In these situations, sectioning the crown rather than attempting to remove it intact is often the best policy. 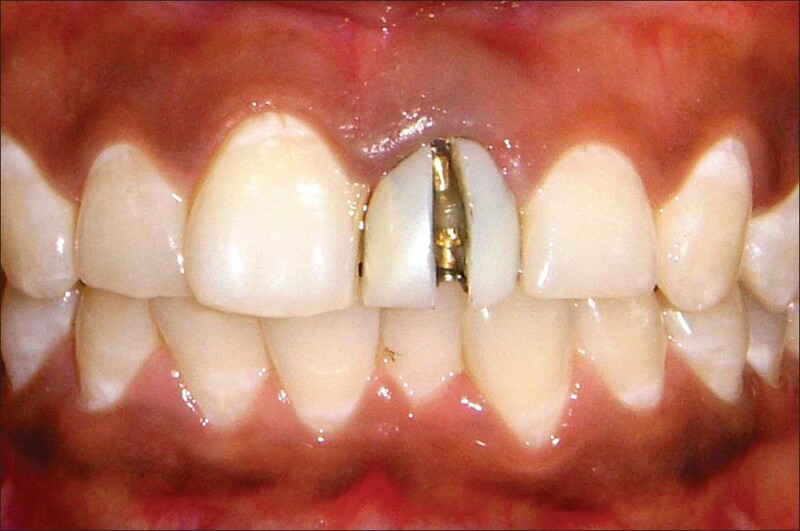 Most of the time, sectioning of the crown requires involvement of labial, lingual as well as incisal/occlusal surfaces. The sectioning technique described in this article involves only facial surface. This technique does not damage the gingival/periodontal tissues or underlying tooth structure as the crown need not to be removed with jerky back-action force. 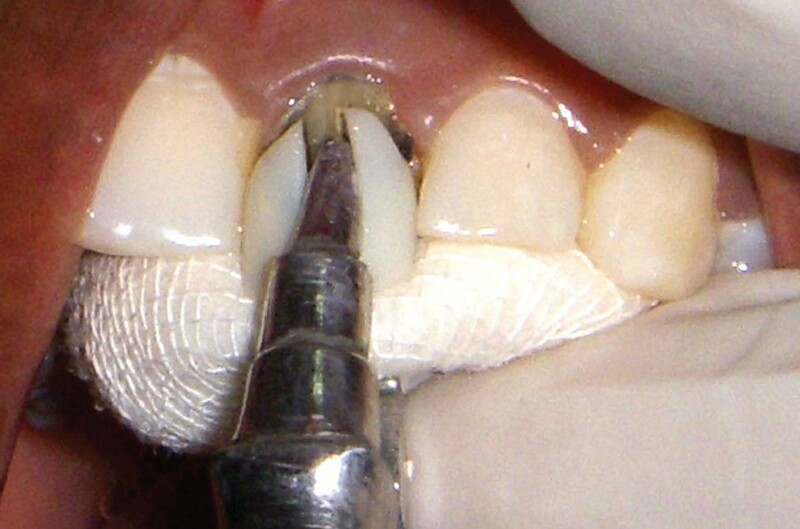 There are two major and definite indications to use this crown removal technique: 1) the crown in patient presenting with tender or mobile abutment tooth and 2) the cement-retained implant supported crown after abutment-screw loosening or other prosthetic failures. Implant supported crowns should not be removed with jerky back-action force or ultrasonic vibration techniques. We are using this technique routinely in our hospital, which seems to be highly efficient and less cumbersome for the operator. Examine the crown to be removed carefully. Section facial surface of the crown along the long axis with a round-end-taper diamond bur (Super coarse diamond; Brasseler USA, Savannah, GA USA) in a high-speed handpiece with water spray to cut through ceramic and/or metal (from crown margin to facio-incisal/facio-occlusal line angle), just to expose the underlying cement layer [Figure 1]. Do not cut the underlying tooth/core structure. Note that the sectioned groove should be lesser in width (mesio-distally) than the width of round tip of the universal orthodontic plier (Universal plier; Jaypee General Agencies, Calicut, India). Pinch the crown by keeping round head of the universal orthodontic plier parallel in the sectioned groove on facial surface and rectangular head of the plier lingually (by keeping gauze pack under the rectangular head) [Figure 2]. Apply controlled force during pinching, just enough to open up the sectioned groove and to dislodge the crown from prepared tooth. Note that once the groove gets opened up, the crown automatically dislodges. Remove the dislodged crown by holding it with plier or give slight removal force on dislodged crown with back-action crown remover (Crown Remover Morrell; Henry Schein Inc., Melville, NY USA) if required. 1. Rosensteil SF, Land MF, Fujimoto J. Contemporary Fixed Prosthodontics. 4 th ed. St. Louis: Mosby; 2004. p. 928-69. 2. Pruitt CO. A review of methods and instrumentation for removing crowns and bridges from prepared teeth. Gen Dent 1994;42:320-6. 3. Parreira FR, O'Connor RP, Hutter JW. Cast prosthesis removal using ultrasonics and a thermoplastic resin adhesive. J Endodo 1994;20:141-3. 4. Sutherland JK, Cheeseman SL. Multiple prosthodontic uses for permanent crown remover forceps. J Prosthet Dent 1997;77:99-101. 5. Williamson RT, Breeding LC. Removing a cemented fixed prosthesis using a crown remover. J Prosthet Dent 1993;69:634-5.